Nov. 9, 2018 – With its six wheels, the 550 T-Pro can easily navigate in difficult terrain and minimizes ground pressure work on sensitive surfaces. The sturdy mid-section in combination with the pendulum arms allows you to easily move the machine with an extended crane, without having to retract the unit. This leads to increased productivity and valuable time saving. With the power of a Volvo Penta D8 of 160 kW/218 hp, the harvester can quickly respond to an increased load. 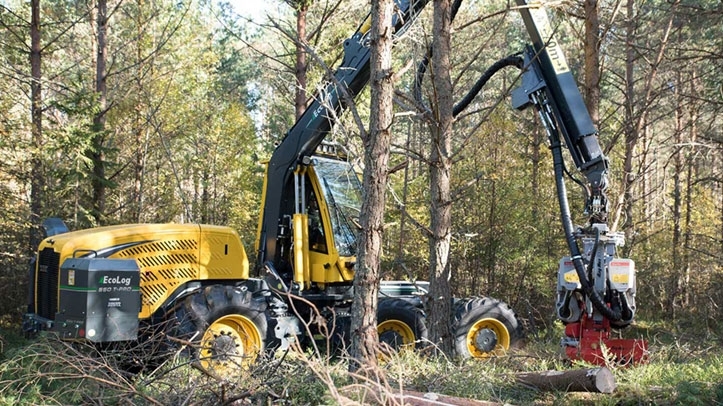 The engines have been optimized for reliable and fuel-efficient forestry. The well-known combination of swivel cab and pendulum arms makes the harvester very flexible and well suited to thinning work. The available harvester heads for this model are Log Max 3000T and 4000T. “With our new thinning harvester, we complement Eco Log’s range with a machine that has been requested by our customers. In this new model, we have kept all of the benefits from the 550 model and added to it with, among other things, more wheels to optimize it especially for thinning work. The new harvester is the first of several product launches we have planned for this fall. We have more exciting things to come!”, said Anders Gustafson, CEO of Eco Log Sweden AB. The new harvester is available on the market in the last quarter of 2018.